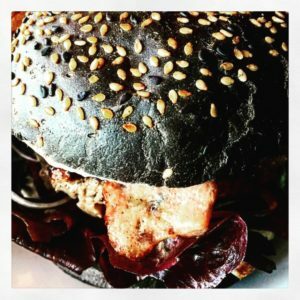 Restaurant Review: The 41 is number one in Camps Bay, cosmopolitan beach restaurant! 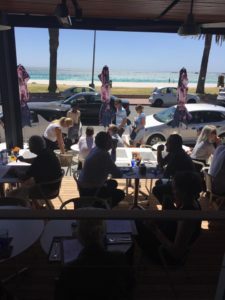 It was by chance that my friend Elize Skriker and I popped in at The 41 yesterday, Camps Bay’s newest restaurant, located in the building which was formerly Tuscany Beach, and which will house Melissa’s new Mantra Café above it. I had first heard of the restaurant opening a year ago via Nigel Price, the owner of Aqua, being their water supplier. He had tried to connect co-owners Gilles Blanc and Nicolas Da Costa with me, but they were traveling overseas when I called to arrange a meeting with them. The restaurant opened on 30 October, and when Elize and I sat down, Gilles came to say hello almost immediately. He would not explain how he recognised me. Gilles and Nicolas have owned restaurants in Asia and in Sydney, but they have all been sold, with the exception of the one in Laos. They have been in Cape Town for a year, awaiting the completion of their new restaurant. 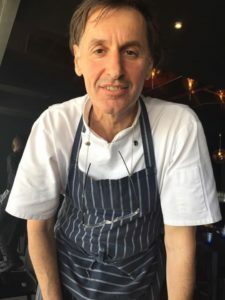 Gilles explained that they were traveling to Sao Paulo via Johannesburg, and when their flight was delayed, they decided to spend a few days in Cape Town. They fell in love with the city, like so many before them, so they never made it to São Paulo. They heard that Nigel Newhouse was looking to sell Tuscany Beach, and the rest is history. The building was rebuilt as a modern double storey glass-enclosed building, facing the magical Camps Bay beach. Giles explained that not only is 41 the street number on Victoria Road, but it also is the name of their favourite restaurant in Paris. They like the name, in being different to the other restaurant names in Camps Bay. The restaurant has glass stacking doors, which were opened wide on a gorgeous summery day yesterday. We sat inside, at a raised level relative to the terrace seating. All tables are black, and the chairs are black moulded plastic. The interior is dominated by the bar counter, and the water feature is behind the bar, with G.H. Mumm branding. Gilles explained that they have sold the branding right to the champagne brand for R50000 for a year. They charge R1190 for a bottle of the champagne, being the only restaurant to stock it in Camps Bay. Gilles explained that they wish to focus on local Camps Bay residents, and charge moderately. They have positioned their restaurant as a beachy one, which is ‘not fancy’ and has a strong local feel. They are stocking Newlands Brewery beer on tap, the only Camps Bay restaurant to do so. Staff are dressed in The 41 branded beige T-shirts, and matching aprons with Paul René sparkling wine branding. The tables have blue water glasses and vases with orange/gold chrysanthemums, adding colour to the interior. Two large mirrors at the far end of the restaurant bring the beach into the restaurant. Stylish cutlery is by Sola, an international brand. Each place setting has a woven black/grey placemat. Gauze napkins are branded with the restaurant name. Outside umbrellas with Lanique branding protect patrons against the direct sun. 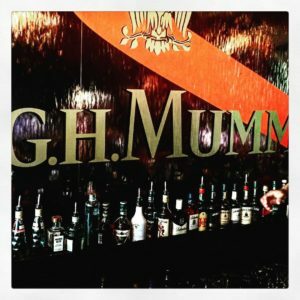 Having come from a restaurant further up the Camps Bay Promenade, where the music became very heavy rock, it was a relief to hear such a good and vibey playlist at The 41. It changes to deep house in the afternoon, and to jazz in the evening. Elize and I only intended to have a dessert at The 41, and we started at the right end of the menu, the dessert selection being refreshingly different, and beautifully plated. 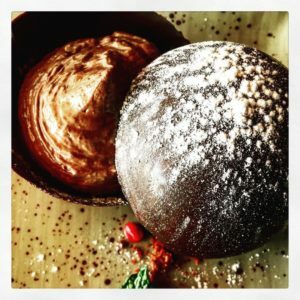 I chose the chocolate mousse, presented inside a chocolate dome, with chopped cranberry and mint on the platter (R70). 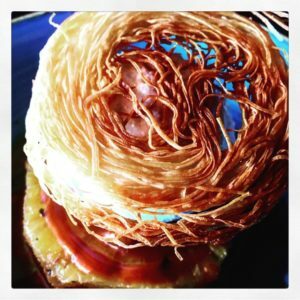 Elize chose the unusual wood-fired pineapple, topped with coconut ice cream and rum caramel, and crowned with deep-fried vermicelli (R60). It was served in a beautiful blue bowl, and I was tempted to do the unthinkable, and check the branding underneath the bowl. It is by Churchill, making stone cast in the UK. The cappuccino was less successful, made in a commercial Nespresso machine which we had seen at Mondiall recently. They made it twice, and we were not charged for it. I ordered a hamburger, plated for the photograph and then placed in a take-away container. It is innovative in that one is offered a choice of meat (beef, chicken, or vegan, costing R95/R85/R75), bun (white sesame, black sesame, and a Banting lettuce cup), sauce (I chose a classic mushroom sauce, but other choices are BBQ, Gorgonzola, and chili-mayonnaise), and a topping (I chose bacon, but other options are cheddar, pickled cucumber, and guacamole). The black sesame seed bun attracted attention as I saw another served on the terrace, and wanted one myself. The hamburger was served with hand-cut chips, and the mushroom sauce was served in a small pot looking like a terra cotta plant pot. Gilles brought Chef Aristotle Ragavelas to introduce him to us. He told us that he is of Greek descent, but has a strong British accent. 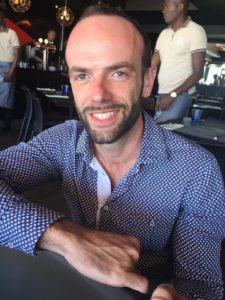 He has been in Cape Town for the past four years, at Ragafellows in Hout Bay, and then at Fork in the city centre. Prior to that he worked in Johannesburg, in London and Manchester, and in Mykonos, Crete, Athens, and the Greek Alps. The 41 impressed us with the uncomplicated yet unusual menu, and the dessert list was particularly impressive, not offering any of the predictable desserts we see so often. We provided feedback about the look of the menu, being A4 pages, our copy looking very worn. Gilles explained that they change their menu almost daily. The making of the dry cappuccino needs more work. 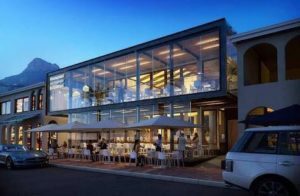 The 41 has given the Camps Bay Promenade a new lease on life, it being quite a while since a new restaurant has opened in Camps Bay. The all-glass building design in itself is modern, and attracts attention, given the older buildings on either side. The 41, 41 Victoria Road, Camps Bay. Tel (021) 437-0558 www.the41.co.za Twitter: @The41restaurant Instagram: @the41restaurant Monday to Sunday all day and evening.